Tiffany Haugen's roots run deep in the Willamette Valley; five generations all told. Her grandfather, a former cattle rancher, is 102 years old and still lives near Springfield where almost all of the family members grew up. Haugen, a popular food columnist and cookbook author, explains that her grandparents knew each other growing up, and her parents went to elementary school together, as did she and her future husband, although she was a year younger and they didn't start dating until after college (he went to University of Oregon, and she to Oregon State, and quips that they eat a lot more duck than beaver). Yet, in spite of what seems like a homesteading mentality, Haugen has spent a good portion of her adult life wandering to the farther reaches of the earth. Along with her husband, she spent several years teaching in remote Alaska, where they lived on caribou and moose. "You've gotta get out of town now and again," she says modestly. Moreover, that balance between the familiar and the exotic also seems to define the dishes that Haugen likes to cook and teach. Much of her cooking centers around game—bird, salmon, elk—but she presents in a way that is much more elegant Betty Crocker than campfire simple. "My favorite go-to is coconut milk," she says. "It keeps lean meat nice and moist." 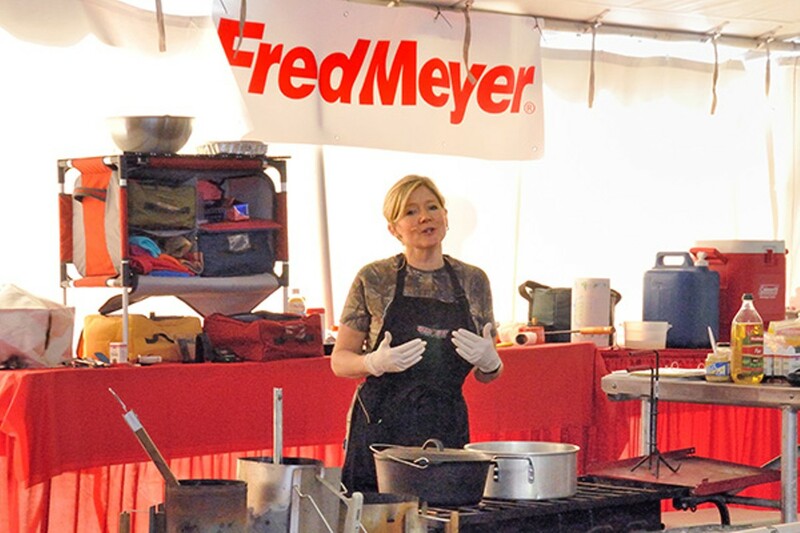 "I'm a home cook, not a chef," points out Haugen, who will present seminars on "Butchering and Cooking Big Game" and "Smoking Fish and Big Game" at this weekend's Central Oregon Sportsmen's Show. She is one of the four so-labeled "camp cooking chefs" presenting on topics like "Dutch Oven cuisine" and "filleting, grilling, canning and smoking salmon." Roger Neufeldt is another presenter—and another Oregonian with deep roots to the state. Born on the coast, his parents moved to The Dalles during the mid-1950s' construction boom there, when a massive dam was being built along the Columbia River. At the time, his dad was a manager for Safeway. Eventually, his dad purchased his own grocery store along Hwy 35 and, as a kid, Neufeldt worked as a meat cutter there. Decades later, when his parents retired and sold the grocery store, the new owner wasn't interested in providing fresh and custom-cut meats, and handed off the gear—the grinders and meat saws—to Neufeldt, who took it home and for years would hold sausage parties (sorry, couldn't resist) at the end of hunting season. "Whatever we get lucky enough to bag in season," he says about the sausages they would make, anywhere from 30 to 300 pounds worth. 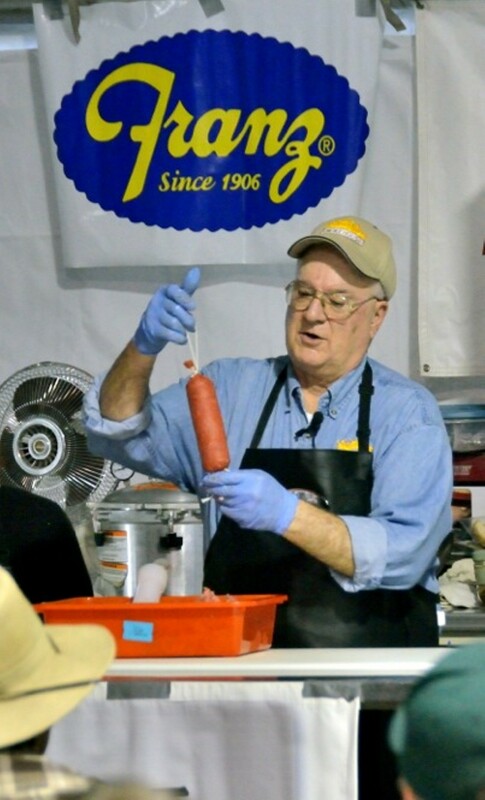 Only a year ago did he start making sausage commercially. "The best sausage is all pork," indicates Neufeldt, but says he mostly does wild game. "That's the nice thing about making sausage is you can put in anything you want." Noon-8 pm, Thurs & Fri, 10 am-8 pm Sat, 10 am-4 pm Sun. Deschutes Expo Center, 3800 SW Airport Way. In a large skillet, heat oil on medium. Add ginger and sauté one minute. Add red curry paste and brown sugar, sauté until bubbly. Add meat to curry mixture and brown. Reduce heat to low and add coconut milk. Salt to taste. Simmer 45 minutes or until meat is tender. Remove from heat, add basil and serve over rice.